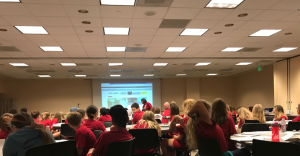 DENVER, Auraria Campus – Denver Post youth content manager, Dana Plewka spearheaded the paper’s 18thYouth Journalism Day on June 19, at Auraria’s Tivoli Student Union. 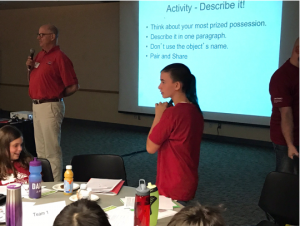 The program, sponsored by MSU Denver’s Journalism and Technical Communications Department, hosted 65 elementary/middle school students from the Rocky Mountain Region. Sharing their industry knowledge with the future journalist were professors Jessica Taves, Mike Peterson, Laurence Washington, Kip Wotkyns and Shaun Schafer who spoke on interviewing, photography and writing techniques. With kids coming from all over Colorado and other states, middle schooler Sylvia Goodman stands out with her passion for journalism. “As a kid in the Next-Gen program,” Goodman says, “it is important for me to be here to get more experience. It’s a great opportunity for me because I love to read, and I’m a huge Marvel and Star Wars fan. Goodman adds that she’s had the chance to write book and movie reviews for popular films such as “Solo” and “The Avengers” since being part of the program. Plewka hopes the students feel like they understand MSU Denver, and that the youth camp is important. This article provides great information about the program and how MSU plays an important role in its success. Love your quotes, David. Nice work.